Marten are Alaska's most widely trapped animal and bring about $1–2 million in revenue each year. The American marten (Martes americana) is a carnivorous, furbearing member of the weasel family. Although similar in color, size, and shape to mink, martens are usually found in the uplands while mink are more associated with streams and coastal areas. In Southeast Alaska, martens naturally occurred on only the mainland and a few adjacent islands. Subsequently, martens were transplanted to the remainder of the larger islands. Through recent studies, the martens on Admiralty and Kuiu islands appear to belong to a unique genetic type which some believe is a separate species (Pacific marten Martes caurina). American martens are found from Southeast Alaska all the way up to the northern and western portions of the state where the last trees disappear and the true arctic tundra begins. The marten's coat is characterized by soft, dense fur which varies in color from pale yellow to dark brown, often shading to black on the feet and legs. Lighter-colored martens tend to have grayish brown tails, while darker animals have dark brown tail fur. The fur around the muzzle varies from gray to light brown with a short dark line extending up the forehead from the corner of each eye. The marten's throat and upper chest are usually pale or buff or deep orange. The ears are erect and rounded. Martens vary in body length from 19 to 25 inches (48–65 cm), not including the tail. They may weigh up to nearly 4 pounds (1.8 kg). Males are considerably larger than females. The tail accounts for nearly a third of the marten's total length. Martens have sharp, non-retractable claws which they use for climbing as well as for holding their prey. Large furry paws allow the marten to travel easily over deep snow. Martens are rather solitary creatures except during the mating season. Mating encounters are temporary and males may mate with multiple females which live within their home ranges. Mating occurs in July and August. Fertilization is followed by a period of delayed implantation, during which the fertilized eggs do not develop beyond the multi-cellular blastosyst stage. After six months the blastocysts implant in the uterus and embryos begin to develop, growing rapidly for about 27 days. The litter, averaging three young, is born in April or May. Young martens are highly dependent at birth and weigh only about 1 ounce (28 gm). Sparsely covered with fine, yellowish hair, their eyes do not open until they are 5 to 6 weeks of age. Under their mother's care, young martens grow rapidly. By late summer they can forage for themselves and become independent. Juvenile martens usually disperse from their mother's territory during the autumn. Martens normally mate for the first time when they are 2 years old and bear young in their third year. Some females may breed at 15 months. Martens depend heavily on meadow voles and red-backed voles or mice, which are their primary food source over much of Alaska. Fluctuations in food availability often create corresponding variations in marten populations. This condition is more pronounced in the less optimum habitat of the marten. Probably the second most critical food source is berries, especially blueberries, followed by small birds, eggs, and vegetation. The marten is a voracious and opportunistic feeder. Carrion such as the remains of wolf kills or salmon carcasses are eaten in many areas. Wild martens are fond of sweets such as jam. They will sometimes take treats from humans. It has been reported that red squirrels are a major food source for martens, but this does not seem to be the case in Alaska. In fact, the two seem to get along quite well. Martens commonly use red squirrel middens as resting places. Although martens are suited for nocturnal foraging, they are also active during mornings and evenings, especially during the long days of summer. Males typically have larger home ranges than females. Within sexes, home ranges are exclusive with little overlap. Home ranges of martens vary in size in response to population levels and food availability. Although 1 square mile may be sufficient for a male when food is abundant; 15 square miles may be required when food is scarce. When food is in very short supply, martens may leave their regular home range areas entirely and travel extensively to find food. Young begin to disperse in late summer, looking for vacant space to establish a home range. While hunting for food, martens cross their home range areas frequently seeking areas with small mammals and resting sites. When crossing open swamps, lakes, or bogs, martens uses every tree for cover, perhaps for protection from large carnivores and birds of prey. In Southeast Alaska, martens select cavities in large, old-growth trees for denning and resting. Martens are very courageous, but when pressed closely in open areas they may burrow into loose snow and tunnel for long distances beneath the surface. If snow conditions prohibit burrowing, martens will climb the nearest tree to avoid capture. When all else fails, martens will stand and fight. 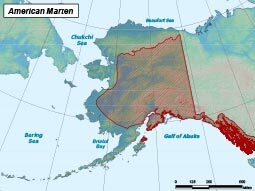 American martens are found from Southeast Alaska all the way up to the northern and western portions of the state where the last trees disappear and the true arctic tundra begins. 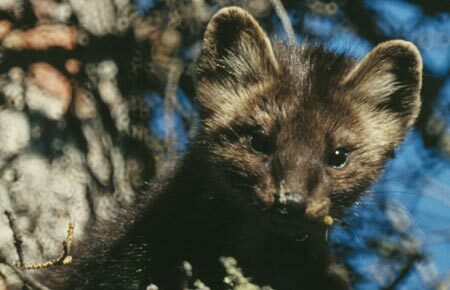 American martens inhabit most forested regions in Alaska, including mainland southeast and some islands in the Alexander Archipelago, mainland Southcentral, central, northern portions of southwestern, and some areas of western Alaska (Kobuk and lower Noatak drainages, southwestern Seward Peninsula). They are often associated with mature and old-growth evergreen forests. Population size unknown, but likely large because widespread and widely trapped. In southeast Alaska, female density ranged from 0.3/1,000 hectares to 1.7/1,000 hectares. Martens are potentially vulnerable to over trapping and habitat loss due to commercial logging and development in some areas. Forest management practices play an important role in conservation of martens since they are most often associated with mature-old growth forested habitats. Martens vary in body length from 19–25 inches (48–65 cm), not including the tail. They may weigh up to nearly 4 pounds (1.8 kg). Marten can live more than 11 years. Due to the harsh conditions in Alaska, their lifespan is typically much shorter averaging about 4–6 years. American martens inhabit most forested regions in Alaska, including mainland southeast and some islands in the Alexander Archipelago, mainland southcentral, central, northern portions of southwestern, and some areas of western Alaska. In Alaska martens primarily eat voles. They also eat carrion (venison, salmon carcasses), birds, and squirrels. They can even be cannibalistic when food is scarce. Avian predators such as bald eagles occasionally prey on marten. Mating occurs in July and August. Fertilization is followed by a period of delayed implantation, during which the fertilized eggs do not develop in the uterus until 6 months after breeding. The litter, averaging three young, is born in April or May.